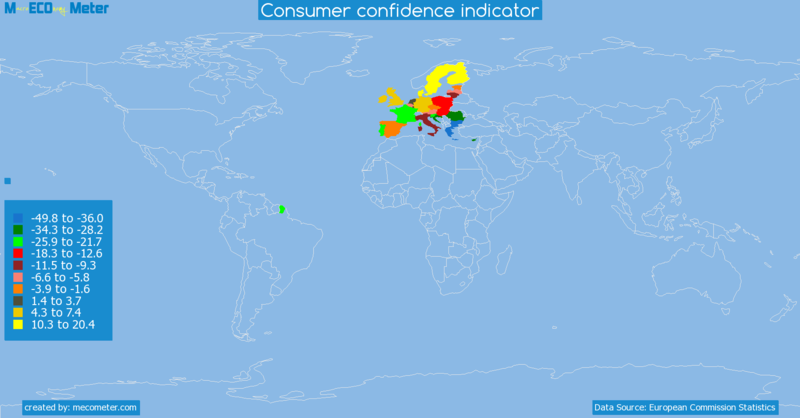 Value & RankThe Consumer confidence indicator of Spain is -3.90 () with a global rank of 12. 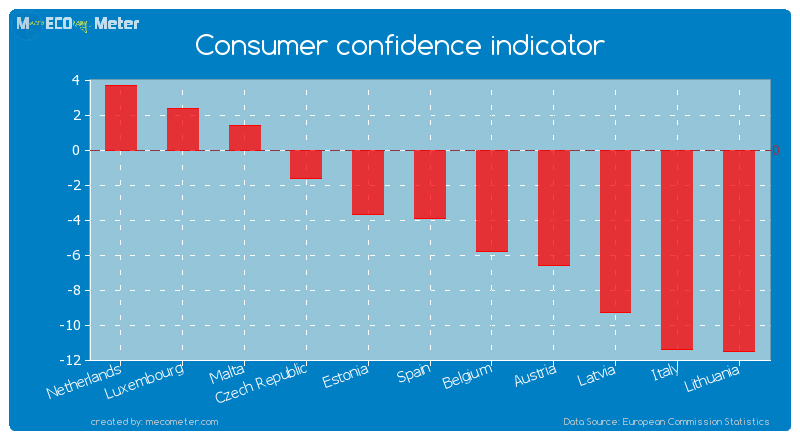 Spain compared to other CountriesThe Consumer confidence indicator of Spain is similar to that of Netherlands, Luxembourg, Malta, Czech Republic, Estonia, Belgium, Austria, Latvia, Italy, Lithuania with a respective Consumer confidence indicator of 3.70, 2.40, 1.40, -1.60, -3.70, -5.80, -6.60, -9.30, -11.40, -11.50 () and a global rank of 7, 8, 9, 10, 11, 13, 14, 15, 16, 17.1 years growthSpain's Consumer confidence indicator had a positive growth of 81.6 (%) in the last 1 years from (2013-08 to 2014-06). 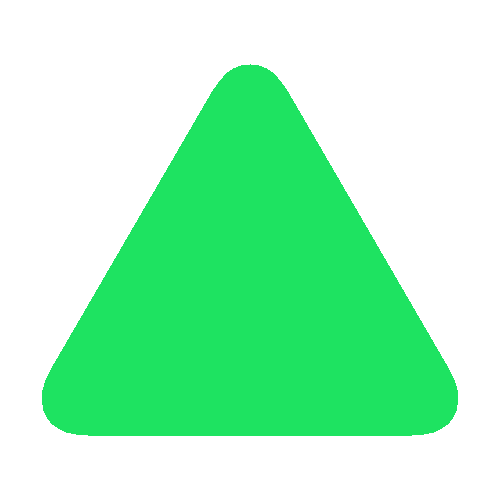 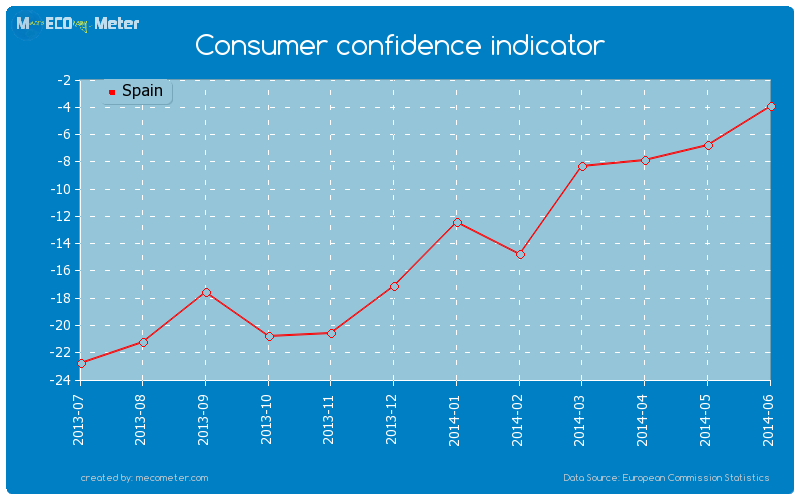 Last 1 years averageSpain had an average Consumer confidence indicator of -13.7 () in the last 1 years from (2013-08 to 2014-06).